Tina: Accounts receivable, data entry, invoice verification, setup of wires and ACHs (automated clearing house), reconciliations, spreadsheets and customer service. Question: Where are you originally from? Tina: Wooster, Ohio – south of Cleveland. Question: From where did you receive your training in finance and factoring? Tina: My first experience with factoring was with Carrier Finance, LLC in Sioux Falls, South Dakota, and I was trained through this company back in January 2001. Question: When did you first decide you wanted to work in this field? Tina: In 2001. I’ve had an interest in accounting since high school, and my first accounting position was during my senior year of high school with a CPA firm. My husband and I moved from Ohio to Sioux Falls, South Dakota in December 2000, and there was an ad in the paper for factoring. I had never heard of factoring and it piqued my interest, so applied. After three interviews I was offered the position and accepted it! Question: When you were young, what did you want to be when you grew up? Tina: I wanted to be a nurse. Tina: Since 2009. RMP Capital bought out Carrier Finance, LLC — the factoring company I went to work for in January 2001. Tina: My most memorable is the first client assigned to me with Carrier Finance, LLC back in 2001; he still remains my client today. From this account, I learned what factoring is and how it works for a transportation client. We have never personally met, but we connect at least twice a week and have for over 14 years now. I even know his wife too! Tina: Love sporting events — I’m a die-hard Cleveland fan… Browns, Indians, Cavs and Ohio State! Love family and host many family gatherings. I enjoy reading and gardening. 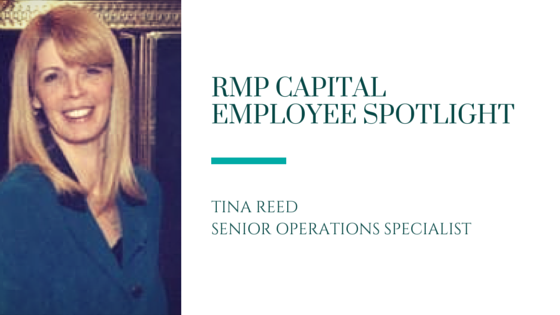 Tina, we’re so grateful for your contributions to RMP Capital. Thanks for allowing us to get to know you a little better! To meet more of the RMP Capital team, visit our website. Don’t hesitate to call us at 631.738.0047 or reach out on Facebook with any questions!